1987 - Michael released his highly anticipated follow-up album to Thriller, titled Bad, worldwide on August 31, 1987 [except in England, where August 31 is a bank holiday] with copies leaving the record shops faster than assistants could fill the shelves. Bad sold 500,000 copies within five days in the UK; a first for any artist in the UK. It debuted at number one in both the US and UK and many other countries around the world. Tower Records in London sold 200 copies in the first hour of trading while CBS [Epic] estimated that some 150'000 copies would be sold at the end of the first day's trading. In Amercia, fans stood in line outside shops from New York to Los Angeles and extra staff was hired to cope with the demand. A hugely successful album in its own right, Bad sold 30 million copies worldwide and became the first (and still the only) album to include five number one singles on Billboard’s Hot 100 sales chart. The album becomes a tremendous success and yes, Michael made history with it again: "Bad" became the second biggest-selling album ever. The album’s production had been a complicated affair, not least for the fact that, despite his status, Michael failed to convince the likes of Barbra Streisand, Aretha Franklin, Whitney Houston and chief rival Prince to record duets with him. Bad would be Michael’s last collaboration with co-producer Quincy Jones, ending pop music history’s most successful production team. The album entered the US Pop and Black album charts at number one, holding its position for 6 and 18 weeks respectively and remained on the Pop charts for 87 weeks, 38 of which were spent in the Top 5. This broke a record of 26 weeks in the Top 5 set by The Eagles' "Hotel California". In Britain, "Bad" hold the number one position for 5 weeks and remained on the charts for 109 weeks consecutively. Michael: "It's very hard to create something when you feel like you're in competition with yourself because no matter how you look at it, people are always going to compare "Bad" to "Thriller". You can always say, 'Aw, forget 'Thriller',' but no one ever will! The album’s title track “Bad” was released on 31st August 1987 (the same day as the Bad album) with an amazing 18 minute long short film, directed by Martin Scorsese. The film was shot on location in New York and starred Wesley Snipes. It reportedly took six weeks to make with an estimated budget of $2 million. The reaction to the short film and single was massive: it shot to number 1 in the U.S. and many other countries around the world. "Bad" is the only album to have 5 of its singles peak at #1 while 10 of its 11 songs were released as singles & 9 of them composed & co-produced by Michael himself. In June, 1992 "Bad" album was certified 6 times platinum & Michael become the only artist to have 3 consecutive albums with U.S. sales of 6 million copies each. CBS-TV aired a special entitle "Michael Jackson - The Magic Returns." Also, the 17-minute "Bad" video was aired. 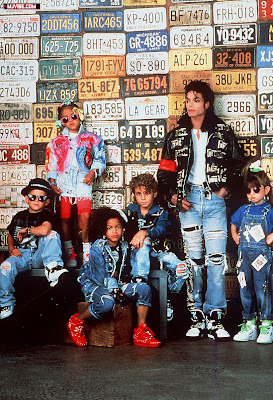 1990 - LA Gear’s first UK advertisement, which did star Michael and his eight year old neice Brandy (daughter of Jackie Jackson), premiered in movie theatres. Michael's first TV commercial in nearly 4 years was heralded a creative breakthrough by the industry. 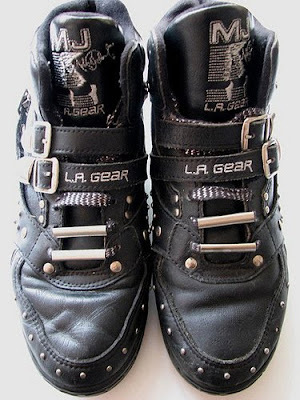 Michael wears black, heavily buckled shoes his LA Gear logo is is embroidered on the tongue. 1993 - Tito and Jermaine Jackson walked off the set of NBC-TV's "Today" show when a crew arrived to interview the two about the troubles of their brother Michael with the Los Angeles Police Department. The two later held a press conference where they stated their support for their brother. 1997 - Shocked by the tragic death of Diana, Princess of Wales, Michael cancelled his 31st August concert in Ostend, saying he was too upset to perform on stage. Diana and Dodi Fayed, the new man in her life, died in a horrific car crash in the French capital Paris, where Michael himself was staying prior to his Belgian gig. 2001 - The first single off the King of Pop's new album, which is due to hit stores in October, debuted at number 34 on Billboard's Hot 100 Singles Chart. The high rating makes 'You Rock My World' Billboard's Hot Shot debut for the week. 1969 - The Jackson 5ive perform at a festival conceived by Mayor Hatcher, the first black Mayor, supporting Yvonne Fair at Gilroy Stadium. 1992 - Michael Jackson perform in Dangerous World Tour concert to a capacity audience of over 32,000 at the Southwest Stadium in Ludwigshafen, Germany. 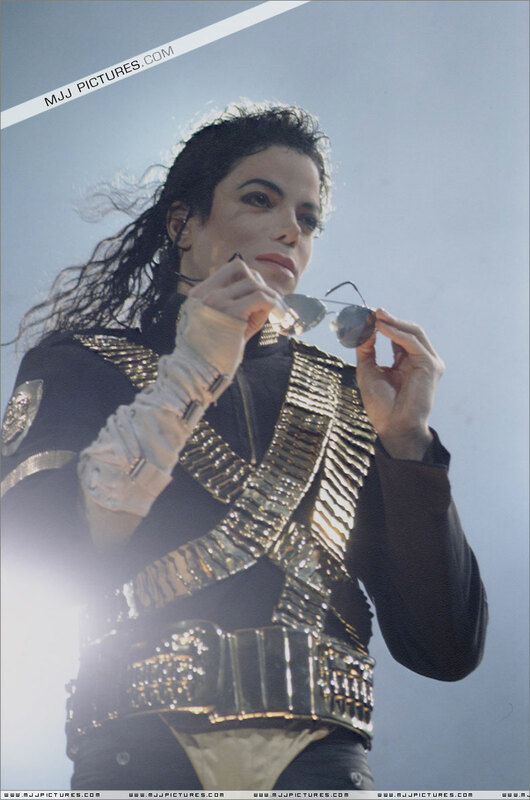 1993 - The second show of the Dangerous Tour in Singapore was cancelled. The Jackson family held a press conference in the U.S. Jermaine Jackson read a statement in support of his brother Michael before announcing that the Family plans for a special: The Jackson Family Honors. The special is due to be filmed in December and televised in January. 2000 - Anastacia has a reputation for being a bit of a dance diva, but the truth is she can rock! Following the global success of 'I'm Outta Love', Anastacia has released her debut album 'Not That Kind'. In an interview, Paul Cashmere of Australian Radio asked her about the day Michael Jackson called her. "Actually, when Michael Jackson called, it was all leading up to the fact that when I did the show 'The Cut', which was the star search kind of show. I was proposed to by a lot of record companies being interested in wanting me to sign with them. In the process of all those meetings and stuff, I was meeting with MJJ, so it was inevitable to meet the presidents of all of these labels, because I was starting to get to that point. Michael Jackson was one of these people that I had to meet, as well as Tommy and Bob Jamieson and the presidents of all the great record companies, so it really was a professional situation. It wasn't like "I'm a really big fan and I want to have you autograph everything that I own", it was a phone call of admiration from a performer to a performer, as a president to an artist wanting to be signed, as an artist looking at what a label has to offer, it was that kind of conversation, but what a light conversation! He was laughing, I was laughing, we were having a great time. It was so wonderful to be able to speak to him. He's so inspiring and what a genius! Forever I'll remember that I got to speak with him on the phone. If I never get to meet him or even work with him in the future, it's the beauty of being able to be recognised by something like that." 2001 - One day after his birthday, Michael Jackson opens up the NASDAQ Stock Market in Times Square, New York and kicks off his Michael Jackson: 30th Anniversary Celebration, The Solo Years performances at Madison Square Garden scheduled for September 7, 2001 and Monday, September 10, 2001, which are being produced by David Gest. 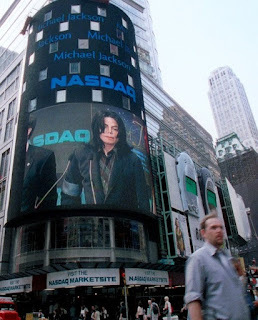 Nearly 500 fans from around the world who are planning on attending the anniversary concerts on September 7 and 10 arrived a few days early to witness Michael's appearance at the NASDAQ MarketSite Tower. Just before the market opened at 9:30 am Michael entered wearing a respectable black suit with a blue armband. He blew kisses to the hundreds of fans that were outside crowding around the building's glass walls and windows while he was introduced to NASDAQ's executive vice president David Weild and NASDAQ CEO Wick Simmons. When Simmons presented Michael with a glass trophy Michael commented, "It's like floating in the air," speaking of an object encased in the trophy. "Well, you're floating," Simmons told him, "right now, out there, in Times Square, on the big billboard that's up out there. You are floating so that everyone can see you." "I'm deeply moved by this very special moment for me. Thank you, David, Wick and NASDAQ. Thank you so much. I love you and all the fans. Thank you." Before he left the building he was taken on a brief tour of the NASDAQ broadcast studio, ate a piece of cake and talked and posed for pictures with some of the staffers. Alfred R. Berkeley, Vice Chairman of NASDAQ, and David Weild, Executive Vice President, host a dinner at Tavern on The Green, in Michael's honor after the concert on Sept. 7th, joined by their event co-chairmen: Whitney Houston, Sean Lennon, Yoko Ono Lennon, Liza Minnelli, Leslie Moonves (President & CEO, CBS), Liam Neeson, Veronique and Gregory Peck, and Elizabeth Taylor. 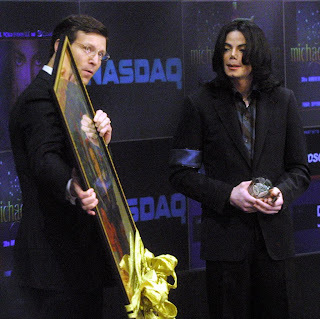 Weild said, "The NASDAQ Stock Market recognizes Michael Jackson for his extraordinary vision and commitment to excellence in the entertainment industry as well as being a humanitarian who is continually seeking creative avenues in which to help others." The NASDAQ MarketSite building is located at 4 Times Square, at the corner of 43rd and Broadway. At 9:30 a.m., Michael Jackson will preside over the market open ceremony from the broadcast studio, which faces the corner of 43rd and Broadway. The broadcast studio has large picture windows to give the public a clear, unobtrusive view into the studio from the street. Nine plasma screens outline the broadcast studio, facing the street, for fans not positioned close to the windows. MarketSite Tower, which is seven stories tall and is the largest stationary video wall in the world, will feature a live broadcast of the market open ceremony. 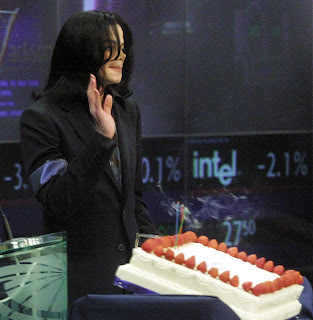 2003 - Michael turned 45. He attended a special birthday party held in his honour; the "Celebration of Love" in Los Angeles on August 30th. The party was attended by fans and friends from all over the world and Michael gave a heartfelt thank you speech dedicated to his fans. "Over the years we became a family. You are all my family. My children are your children and all children of the world are our children and our responsibility. My birthday wish is that you, my fans, will join me in some new undertakings and that we all travel into a bright future together. I feel young enough to look into the future with great optimism." 12 year-old Trisha, from USA suffering from asthma, recounts her story of meeting the entertainer a year and a half before, via Make A Wish Foundation, one of the trusts the singer would support (for two decades). Her number one wish was to meet the entertainer and she is among the manifold children that were given the opportunity to meet him over the years. "They told my mom and I, that we were flying to Los Angeles in three weeks to go to the Celebration Of Love concert. I screamed and cried. I couldn't wait", says/writes Trisha. "... [At the concert], some guy ... said that Michael would like us to go up to his dressing room. So, my mother and I, plus the other 2 families that were there, walked up the narrow staircase and walked into the dressing room and he was standing in the corner, in front of the firehouse", she recounts. "I was the second to walk up to him and he hugged me so tightly. His colonge got all over the shirt I was wearing, but I hugged him again and started crying. I told him I was a fan since I was 1, and he went "Wow...Thank you". I couldn't believe he said ‘Thank you’ to me. Michael and my mother were starting up a conversation about a place in Scotland from where she was, It was Lochlomond I believe. I still couldn't believe it.. The next day (Sunday), we got on a bus and drove for three ours to the Neverland ranch, where fans were loaded down the street with "Happy Birthday, King Of Pop!" banners everywhere. I [have] seen Michael pull out in his black S.U.V, I think, but wasn’t sure... That's how I got to meet Michael Jackson", writes Trisha on www.mjfanclub.net. 2004 - The Olympic Stadium Greece was left rocking last night (Sunday), as the games came to an end and made way for the closing ceremony. A huge party was staged featuring lots of music, mixing classics with the new and containing a spectacular array of dazzling fireworks along with lots of confetti and balloons. 1958 - Michael Jackson was born in Gary, Indiana, on a late summer night on August 29, 1958; the seventh of nine children. Father Joe Jackson was born in Arkansas. In 1949 Joe married Katherine Scruse, whose people are from Alabama. "My experience with Marlon and Brandon didn’t dissuade me from getting pregnant again. The following year August 29, I gave birth to another boy. I remember that day well... my neighbor Mildred White and I were driving over to see the new grammar school under construction, Garnett Elementary. At my request Mildred drove me home. I called my mother and she and my stepfather drove me to Mercy Hospital. Shortly after I got there, I began having contractions. Later that night, my son was born. 'I want to name him,' my mother said. I hated her first suggestion: Ronald. By then I was used to seeing my babies born with funny looking heads, so I wasn’t alarmed by Michael’s. The two other things I remember about him as I held him in my arms for the first time were his big brown eyes and his long hands, which reminded me of my father-in-law’s." 1965 - On Michael's seventh birthday, he and his brothers performed at a fashion show held at Big Top department store in Gary, Indiana. Evelyn Lahaie, the woman who owned the modeling school that was hosting the show, booked the band, but told Joseph Jackson that the name "The Jackson Brothers" sounded too ordinary, and suggested he change it to "The Jackson Five". It was with this gig that the band first played under their new name. 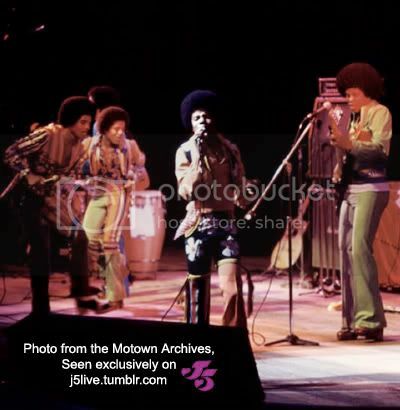 1972 - The Jackson 5ive perform at Honolulu International Center Arena in Hawaii. 1979 - Michael Jackson turned 21. His management contract with his father’s company, Joseph Jackson Productions, lapsed and was not renewed. Michael wanted to take full control of his music and business affairs and he hired his own accountants, lawyers and management. Weisner and DeMann were signed on as Michael’s personal management. 1988 - Michael performed on his 30th birthday at Leeds, England, where 92,000 adoring fans sang him "Happy Birthday". Michael turned 30 years and 92,000 fans packed into Roundhey Park in Leeds celebrated by singing ‘Happy Birthday’ to him. Overhead, a plane circled, a huge ‘Happy Birthday Michael’ banner in its wake. After the concert, Michael donated $1.3 million grossings to "Give For Life", a British charity in Leeds, England, aiming to raise towards an immunisation programme for 40,000 children. He also presents a check for 65,000 pounds to the mentioned charity-organization. 1992 - Michael spends his 34th birthday in Regensburg at the castle of Princess Gloria Von Thurn And Taxis. 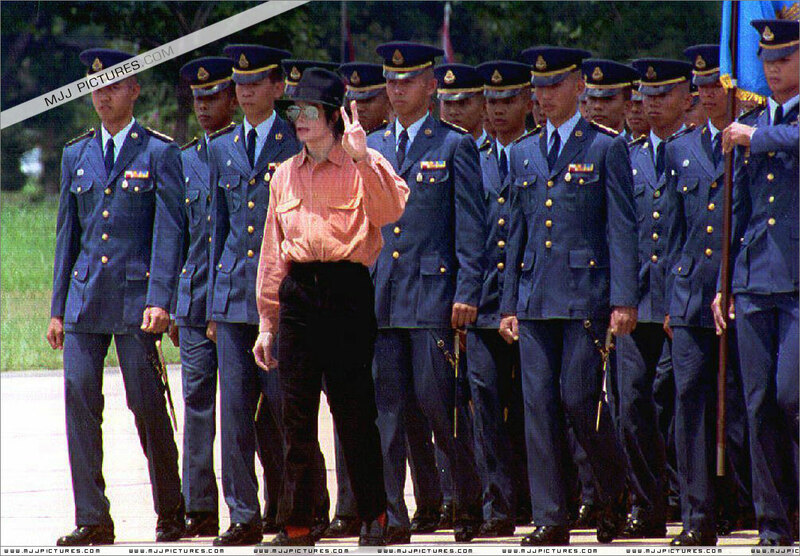 1993 - In Singapore, a 47,000 strong sell-out crowd sang ‘Happy Birthday’ to Michael following the opening number Jam. It was his 35th birthday and Michael, pointing to band members for their cheeky ploy, was clearly embarrassed. But – dominating front pages headlines around the world for all the wrong reasons – Michael must have been far from happy. 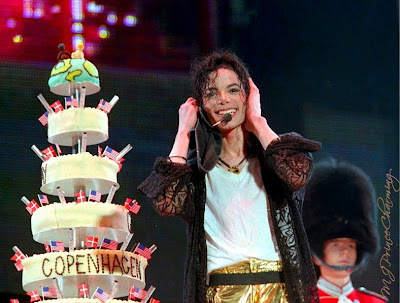 1997 - Jackson performed at the Parken Stadium in Copenhagen, Denmark on his 39th birthday with 50,000 fans. He was presented with a surprise birthday cake, marching band, and fireworks on stage before the Jackson 5 Medley. A concert was supposed to take place on August 7 in Ljubljana, Slovenia, but was cancelled due to poor ticket sales, the only concert that was cancelled during the tour. MJ:One of the best moments is right here. It’s right in the middle of the show and ...it’s my birthday and I’m thousands of miles away from my family. 2002 - News broke that Michael is singing back-up on Monica's new album [same titled first single] "All Eyez On Me". Michael Jackson was presented a massive birthday cake at the MTV Video Music Awards. Britney Spears presented the gifts to Jackson. At the MTV Video Music Awards, which took place at the Radio City Music Hall in New York on August 29, Michael Jackson received a special award. At the beginning of the MTV show, singer Britney Spears came on stage to present the award. 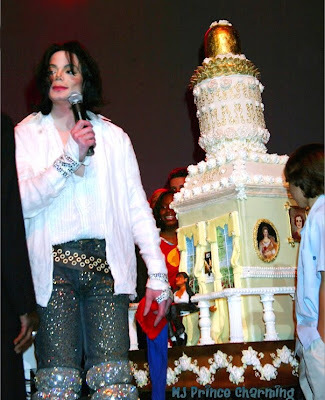 As it was Michael Jackson's birthday there was a huge four-layer cake, white with black musical notes and silver stars positioned in the back. The award, a silver treble clef, was on the table with the cake. "I am thrilled to be here with you in New York on such a special night. And it's more special because it just so happens to be someone special's birthday. This is someone who's inspired me and just about everyone in this room and the world. I consider him the artist of the millennium. He's a true innovator who pioneered the true art of music video, broke down countless barriers and sold more records than any other artist along the way. So, happy birthday my friend, the King Of Pop." Then Michael came on stage to the intro to Billie Jean and received a standing ovation from the audience. Wearing black pants, a red top with applications and white/golden knee pads, his hair was shoulder length and straight. He was smiling and looked very happy. "Well...um...God Bless you. Um...I love you too [to the fans yelling at him]. Thank you very much, Britney Spears you're wonderful. If... when I was a little boy in Indiana, if someone had told me... if someone had told me that one day I would be getting, as a musician, the 'Artist Of The Millennium' award I wouldn't have believed it [laughs]. This is really amazing. I can't believe it. Thank you so very much. But there's a couple of people I have to thank who made this possible [he reaches into his pocket for a piece of paper, and unfolds it]. First I'd like to thank God who makes all things possible. My mother, Joseph Jackson, Katherine Jackson, Trudy Green, Howard Koffman, the genius of John McClain, John Brenka, Berry Gordy, Diana Ross, Gladys Knight, Quincy Jones, I love you. David Blaine your magic is real and I believe in you. And I'd like to thank... I think James Brown is a genius. And all the fans around the world, I love you. God bless you. Thank you." Then Michael made the peace sign, took the award, looked again at the cake and exited the stage. The same night there was a controversy as to whether or not MTV actually gave Jackson an award. MTV promised to honor Jackson by presenting him with a new, special award. Jackson showed up, helping to boost their ratings, while MTV later made a mockery of the entire event, when higher-ups had MTV pull the award to teach Jackson a lesson--this happened during the big falling out Jackson had with Sony Music. MTV pretended like Jackson went up on stage and gave himself an award, or had a "misunderstanding" of how he was being honored that night; his birthday by the way. But apparently nobody warned to the guys running MTV's website that the award had been yanked or that Jackson was being made a fool out of because they posted the information about the Artist of the Millennium Award on MTV's site that night: "Michael Jackson's unprecedented Artist of the Millenium award!". The next year MTV show, the presenters Fred Durst & Jack Black participated in a disgusting -- and rather unfunny actually -- parody of the event where he mocked Jackson, with Durst stating that Black was the "funniest man alive." In 2009, MTV retconned that he had indeed been honored with the Artist of the Millennium Award. Years after denying it and making hateful jokes about it, someone at MTV is apparently trying to come clean by admitting -- in a nondirect, cowardly way -- that the Michael Jackson did receive the "Artist of the Millennium" award in 2002. The caption (see screenshot) underneath a picture of Michael Jackson that night reads: "Britney Spears presents Michael Jackson with the Artist of the Millennium Award at the 2002 MTV Video Music Awards". Now after Jackson's gone, along with the subsequent outing of MTV as a racist network in the 80s for refusing to play black videos before Jackson broke through, apparently they are a little less tight lipped with the truth. 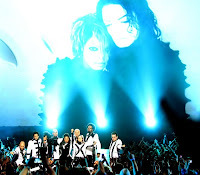 At the 2009 Video Music Awards ceremony, MTV even made a tribute show to honor Michael Jackson. After Madonna[rather unqualified for that task] opened the show talking about her experiences with Michael Jackson, the Michael Jackson tribute commenced, including Janet Jackson performing the duet "Scream" the duet she and Michael recorded together in 1995. Janet matched footage of brother’s dancing in the music video move-for-move as it played on a screen behind her. The show closed with a sneak preview of Michael Jackson's "This Is It" documentary movie. 2008 - Michael gives an interview by phone to "Good Morning America" from his home in California with Chris Connelly. Facing a personal milestone that finds many people looking back, Jackson is focused on the future, which he thinks is brighter then ever. MJ: I am still looking forward to doing a lot of great things, so that's hard....I think the best is yet to come in my true humble opinion. His every appearance setting off a frenzy of fan adulation, his every performance a jaw dropping marvel like when he first busted out the moonwalk. Decades later it's fair to wonder can Michael Jackson still do all that at the age of 50? Oh yes he can, he says! MJ: Yes!! Because I am expanding a lot of the avenues... People see some of the things I do and they say why don't you show this to the world. People don't know you do these things! Well, maybe I will. And he says he wants to give his kids the kind of childhood he never had. Chris: Would you like them to have the same kind of upbringing you did in terms of getting into show business at an early age? Or do you want to say to them whoa, take a moment, enjoy your childhood? MJ: I am letting them enjoy their childhood as much as possible. I really do. I let them go to the arcade and get out and go to the movies and do things. I think that comes naturally, you know. I want them to get to do the things I didn't get to do. Chris: It must mean a lot for your kids to be able to do the things that you weren't able to do, huh? MJ: Yeah, I get pretty emotional when I see them having a wonderful time. When they are on a ride and they are screaming and they are happy and they are running. It makes me emotional. 1984 - The Jacksons’ Victory Tour broke the record for concert ticket sales. The group surpassed the 1.1 million mark in only two months. 1992 - Michael Jackson performs Dangerous World Tour to a capacity audience of 60,000 in Frankfurt, Germany. 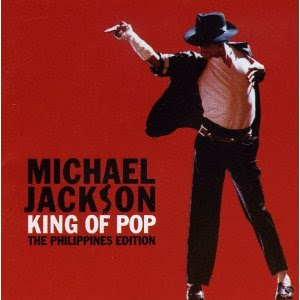 2008 - The fan-voted album King of Pop was released in Philippines and Hong Kong. Philippines: Sony BMG Philippines and MYX Music Channel announced the Philippine release of the King of Pop. Filipino fans were asked to send their Top 10 all-time favorite Michael Jackson tracks via e-mail. This is the only version of the album to contain the single Gone Too Soon. 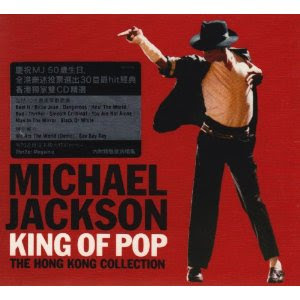 Hong Kong: On August 6, it was announced that Hong Kong joins the many countries worlwide to released a special version of 'King Of Pop', a limited 2 CD digi-pack pressing. Fans could vote for 10 of their favorite tracks on the web site of Sony BMG Hong Kong. 1991 - "Looking Back To Yesterday: A Young Michael" was released by Motown. 1993 - After postponing twice because he was suffering from acute dehydration, his second Bangkok concert was finally staged on 27th August before a capacity 70,000 audience. Clearly believing, as he resolutely maintained, Michael was innocent of any wrongdoing, fans chanted their support and waved banners with Michael’s name and 'We love you' on them. 1994 - Michael Jackson is on the cover of Derniere Heure magazine. 1997 - News broke that singer Joni Mitchell and Sony / ATV Music Publishing signed a major deal [effective July 1, 1997] to administer Ms Mitchell's music catalogue. Sony / ATV is a joint venture owned equally by Sony Corporation and Michael Jackson, and is the world's 3rd largest [!] music publishing company. The firm will handle requests to license Ms Michell's songs worldwide for use in various outlets, including film and television, except for Australia, Italy and Britain. Michael Jackson is on the cover of Kroonika magazine, Estonia. 1995 - Michael Jackson testified in a lawsuit brought against his family by the producers of the "Jackson Family Honors" show. He stated that he never promised to perform, but agreed to present awards. 1971 - The Jackson Five’s ABC album rules the Billboard R&B chart summit, one of three LPs by the group that spend a total 31 weeks at the top in 1971. 1972 - The Jackson 5 single "Lookin' Through The Windows" hit #16 in the U.S. Lookin' Through the Windows was the title track as well as the second single off J5's fifth studio album on Motown. The album would go on to sell 3.5 million copies worldwide while the single went to number five in R&B. All Music Review: Starting with the arresting strings-dominated accents that are similar to the ones found on the ending riffing section of Issac Hayes' "Shaft," the Jackson 5's "Lookin' Through the Windows" stands as one of the group's most intricately arranged sides, robust with striking vocal harmonies, dazzling counterpoint, and energetic time changes. The title refers to the lyrical theme which revolves around the "eyes are the windows to the soul." The song was written by Clifton Davis who also wrote their airy 1971 number one R&B hit "Never Can Say Goodbye." Also on the same day, Michael perform at the 1972 Forum show, Saturday night, August 26, 1972, Michael was three days from his 14th birthday. Motown had launched him as a solo artist the year before and he already had three hit singles on his own; by this concert “Ben” was the current release. He gets a significant solo spot in the show, made all the sweeter with his brothers’ harmonies backing him up on each song. This spectacular version of “Got To Be There” is one of six solo MJ songs perform live at the forum. Man, he gets up there strong. 1981 - The Jacksons perform Triumph tour at Milwaukee Arena, Milwaukee, USA. 1984 - The Jacksons perform Victory tour at Rich Stadium, Buffalo, New York, attending 47,000 fans. 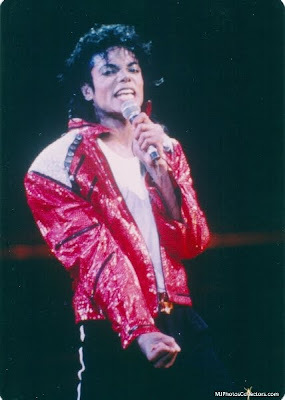 1988 - Michael perform the 6th of seven sold out Wembley shows of the Bad tour at Wembley Stadium, London, England. 1992 - Michael perform Dangerous World tour at Prater Stadium, Vienna, Austria attending 50,000 fans. 1993 - The scheduled concert on the 25th in Thailand, during the Asian leg of the Dangerous tour, was cancelled and rescheduled for the 26th. The concert was again cancelled because Jackson had not fully recovered from dehydration and stress pertaining to the allegations. Jackson released an audio-taped message to his fans saying "I promise all my fans to perform at the National Stadium in Bangkok on August 27. I will see you Friday. I love you all." 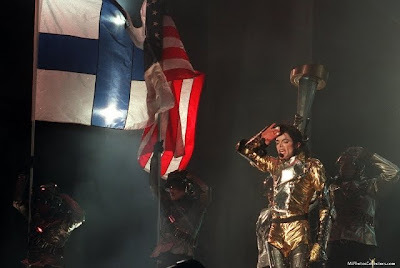 1997 - Michael perform HIStory World tour at Olympic Stadium, Helsinki, Finland. 2003 - It was announced the Michael Jackson would open his Neverland Ranch to people for a "once in a lifetime" event for $5,000. The invited guests would get a tour of the grounds and eat two meals on September 13. 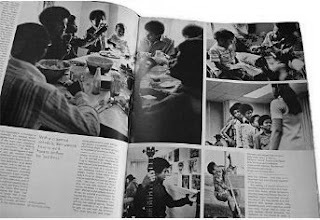 1970 – The Jackson 5ive are at Look Magazine, Volume 34 Number 17. 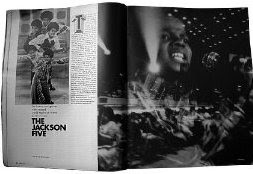 Cover story: JACKSON FIVE: "Bubblegum soul takes off". THE JACKSON FIVE: The Hottest new group in the record world has to be in bed by ten o'clock. "Led by Michael, 10, the Jackson quintet is an exaltation of earthy songs and hip street dancing that sends teen audiences wild." by Ernest Dunbar, Photographs by Douglas Jones. 1973 – The Jackson 5ive concert in Los Angeles. 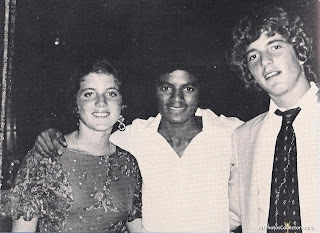 1978 - Michael attended a reception for the Robert Kennedy Tennis Tournament at the NBC Building in New York City. Jackie [Kennedy] invited Michael to accompany her to the Robert Kennedy Tennis Tournament, where she introduced him to her children; John F. Kennedy Jr. & Caroline Kennedy. 1992 - The first Heal The World European Children’s Congress meets in London, England. Eighty-four children between the ages of 8 and 16 come together to express their views on the world's biggest problems and the solutions, as they see them. Despite a case of laryngitis, Michael arrives at Regent's College after lunch and stays for approximately four hours. 1993 - Michael's Bad and Thriller albums certified 7x and 22x platinum by RIAA. 2008 - The fan-voted album King of Pop was released in Belgium, New Zealand & UK. UK: On July 18, the United Kingdom version of the compilation was announced. Sony BMG UK teamed up with GMTV and The Sun allowing fans, until August 10, to pick 18 tracks from the song pool. The pool list, at only 50 tracks, is the least diverse; there were no songs included from Jackson's group career. 66,000 people took part in the vote. Despite the pool conducting a possible 18 tracks, only 17 are included. Most notable is the fact that "Scream" is included on the album, as this song had not appeared on any compilation album in the United Kingdom prior due to legal rights with Janet Jackson's label Virgin Records. New Zealand: On July 3, it was announced that fans in New Zealand would have until July 20, to vote for their version of King of Pop. Fans could vote for five songs in a pool that differed slightly from the Australian song pool. The songs available from Thriller 25 were different; "For All Time" had been replaced by "The Girl Is Mine 2008" and "Wanna Be Startin' Somethin' 2008". "Todo Mi Amor Eres Tu" from Bad (2001 special edition) was not available. 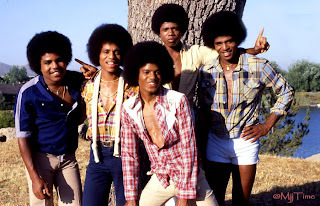 While the Australian pool included seven songs from Jackson's group career, the New Zealand pool had only three: "Blame It on the Boogie", "Can You Feel It" and "State of Shock". Belgium: On July 26, it was announced the released of the double disc album. Fans could vote for their 5 favorite tracks from a pool of 124, on the web site of the Belgian newspaper Het Nieuwsblad. This is the only version of the album to contain the single Girlfriend. 1973 – The Jackson 5 perform in concert in San Francisco, California. 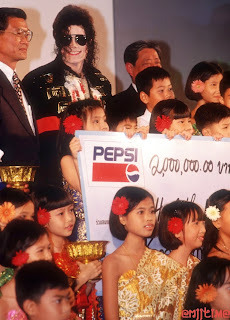 1992 – Michael Jackson attend the first Heal The World European Children Congress at Regent’s College in London. 1993 - Michael kicked off the second leg of his Dangerous tour in Bangkok, Thailand performing first of two concerts at the National Stadium attending 70,000 fans. 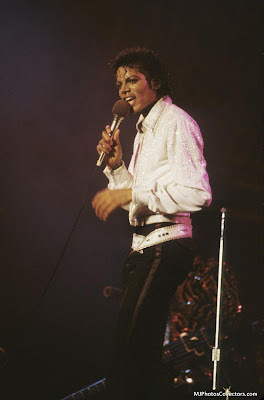 After the cancellation of what should have been the first two dates of the second half of Michael’s Dangerous World Tour, much to the disappointment of the Hong Kong fans who lost out, the tour resumed in Bangkok, Thailand with Michael dropping Working Day And Night, Beat It and Man In The Mirror from the show, and adding his American Music Awards’ Dangerous routine. "HTW" partners with "Pepsi-Cola Thailand" to endow 40,000 dollars to the "Crown Princess Maha Chakri Sirindhorn's" foundation and to the Rural School Children and Youth Development Fund, as a sponsorship for school meal programs in the villages of Thailand. The tour moved through Asia, Russia and onto South America. Michael played his last show of the Tour on the 11th of November, 1993 in Mexico. The Tour had ended suddenly as Michael had become the subject of child abuse allegations and had become dependent on painkillers due to recent surgery on his scalp. Michael had played 69 concerts to approximately 3.5 million fans and had donated all proceeds to his Heal the World foundation and other charities around the world. It was the biggest tour of its time. Michael spends few days in Bangkok to perform 2 concerts on August 24 & 27. At 270 feet, the "Dangerous" stage is wider than the widest American stage at New York's Radio City Music Hall, which measures 190 feet. Also on that day, reports surfaced in the media that Michael is under criminal investigation for child abuse by the Los Angeles Police Department. Michael was honoring his Dangerous World Tour concerts (the entire proceeds of which being donated to his Heal The World Foundation) when news about allegations of improper conduct towards a minor broke and were made public by August 24, 1993. He was preparing to perform song “Jam” when he learned about the shocking news. Regardless of it, he mustered up strength and performed the song, at the beginning of it removing a pair of dark glasses and revealing wet eyes and a tear streaking down his left cheek. Three days beforehand, a search warrant was issued, allowing police to search Jackson's Neverland Ranch, Santa Ynez Valley, California. Investigator Anthony Pellicano says the accusations are the result of a failed attempt to exort money from Michael Jackson. It transpires the boy's father, Evan Chandler, a dentist in Beverly Hills, wanted Michael to fund movie projects for him, so he could become a full-time screen-writer. When this request was refused, he threatened to make child molestation allegations against his son public. Following the criminal allegations, Jackson's newly hired criminal lawyer, Howard Weitzman, reads a statement to the press from the singer: "My representatives have continuously kept me aware of what is taking place in California. I appreciate the remarks of Chief Willie Williams and our Los Angeles police department. I am confident the department will conduct a fair and thorough investigation and its results will demonstrate that there was no wrongdoing on my part. I intend to continue with my world tour, and look forward to seeing all of you in the scheduled cities. I am grateful for the overwhelming support of my fans throughout the world. I love you all. Thank you. Michael." The molestation story will dominate newspapers, magazines, and scandal TV shows for many months to come. 2001 – "You Rock My World", the first single from the forthcoming album "Invincible" was premiered online, on internet at michaeljackson.com. Does HIStory repeat itself? Looks that way. Michael Jackson's overdue Invincible isn't out till (fingers crossed) Sept. 25, but homages to the King of Pop keep popping up. We rate -- giving up to four gloves -- those who dare to walk the (moon)walk. 2004 - The Sony Music Store USA is accepting preorders for the new 5 disc set 'Michael Jackson: The Ultimate Collection' (Selection # : 092600). The scheduled release date is October 19, 2004. 1988 - Michael Jackson performs Bad World Tour at Festival Grounds, Werchter, Belgium. 1992 - Michael Jackson performs third at final concert of Dangerous World Tour at Wembley Stadium, London attending 72,000 fans. 1997 - Michael Jackson's single "Stranger in Moscow" hit #91 in the U.S.
2002 - It's official: People Magazine reported that Michael became daddy again for the third time!! People magazine reported that the "King of Pop" has a 6-month-old boy, Prince Michael II (nicknamed "Blanket") was born in February 2002 with the help of an unknown surrogate mother whoes identity was kept a secret. 1969 - Michael (Not yet turned 11) and the Jackson 5 made their first television debut performing The Isley Brothers' It's Your Thing at the Miss Black America Pageant in Madison Square Garden, New York City, won by Gloria O. Smith, Miss New York. 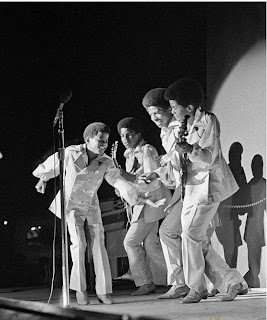 1973 - The Jackson 5 performs in concert in Dallas, Texas. 1994 - Michael & Lisa on the covers of Salut & Jet. 1997 - Michael performs 2nd concert of Dangerous world tour at Wembley Stadium, London attending 72,000 fans. 1997 - Michael performs HIStory world tour at Song Festival Grounds, Tallinn, Estonia. 2001 - David Gest, producer of the 30th Anniversary concert tributes for Michael, has announced today that over 50 legendary actresses of the Silver Screen will be in attendance to help honor the King of Pop. The list of Hollywood's golden glamor girls includes (alphabetically): Carroll Baker, Ann Blyth, Petula Clark, Angie Dickinson, Patty Duke, Rhonda Fleming, June Haver, Celeste Holm, Sally Ann Howes, Kim Hunter, Anne Jeffreys, Jennifer Jones, Eartha Kitt, Piper Laurie, Janet Leigh, Gina Lollobrigida, Ann Miller, Liza Minnelli, Patricia Neal, Margaret O'Brien, Jane Powell, Debbie Reynolds, Barbara Rush, Jane Russell, Ann Rutherford, Lizabeth Scott, Penny Singleton, Jill St. John, Elizabeth Taylor, Ruth Warrick, and Esther Williams. "I am honored these legendary ladies of the silver screen will be a part of those evenings. Each one of them is fondly remembered by moviegoers throughout the world for their unforgettable performances which have stood the test of time. To be in the same room with so many screen greats is a real honor." 2004 - Security precautions for Michael Jackson at the court have been heightened after threats that had to do with inflicting bodily harm on the entertainer. At a hearing on Thursday, defense attorneys for Michael Jackson showed a judge videotapes of the raid on November 18, 2003 on the Neverland Valley Ranch. At the hearing defense attorneys were attempting to limit the evidence prosecutors can present during trial in January. They argue that the search was overly broad and unjustified. In a one-hour excerpt from some 15 hours of video, detectives from the Santa Barbara County Sheriff's Department trudged ahead of a videographer as they opened doors in Michael's home, a Tudor-style mansion with dark wood paneling and glittery chandeliers. For example the detectives swept into the entertainer's "toy room," where his children often played with life-sized "Star Wars" figures and a larger-than-life Superman figure. They also videotaped the wine cellar, business office and the "classroom," with its child-sized desks, where Michael had his children home-schooled. Michael and his family were not at home when the search began at 9 am and ended well after midnight. Some 40 officers participated, trucking with them portable toilets and two crime scene investigation trucks for collection of evidence. 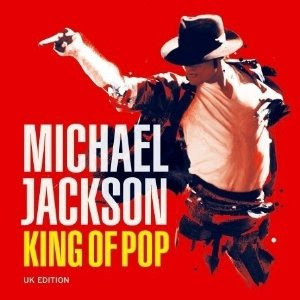 2008 - The first release of the fan-voted album King of Pop (which is identical to the Swiss edition) was released in Germany, Netherlands, and Switzerland. On July 14, it was announced that German fans had until July 28 to choose their top 30 songs from an extensive pool of 121 tracks; the list contained almost every song Jackson released in his solo career. Notably expansions on the pool choice included: A larger option of tracks from Thriller 25 and the inclusion of 12 tracks from The Ultimate Collection. There were also 8 tracks included from the singers time in The Jackson 5/Jacksons; slightly more than the other versions. 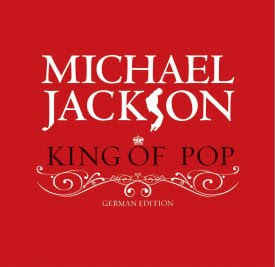 The German Edition of 'King of Pop' is a 30-track compilation and contains 2 bonustracks - 'Got the Hots' (for the first time available on CD in Europe - from the original Thriller studio session) and a brandnew 'Thriller MegaMix' by Jason Nevins. 1971 - The Jackson 5 song Maybe Tomorrow hit #20 in the U.S.
"Maybe Tomorrow" was released in June, 1971 from the Jackson 5's album of the same title. The ballad was originally supposed to have been sung (possibly in a different production) by Sammy Davis, Jr. but for various reasons, the entertainer could not get on the schedule to do the song and the song was then given to the Jackson 5. 1988 - Michael Jackson performs Bad World Tour at Talavera Wiesen staduim, Würzburg, West Germany. 1990 - Michael confirmed Sandy Gallin of Gallin-Morey Associates – who already represented the Pointer Sisters, Dolly Parton and Whoopi Goldberg, to name but a few as his new managers– was stepping into Frank Dileo’s shoes. 1994 - The Jacksons, minus Randy, performed at a U.K. Scientology fund-raiser "For The Children Of The World." 1995 - "You Are Not Alone" released in UK, enter in chart at number 3. The week later it'll reach the top of the chart. 2001 - According to Rolling Stone, the King of Pop won't be appearing on rapper Jay-Z's upcoming CD 'Blueprint,' as has been previously reported. In order to make the September 18 release date for the album Jay-Z had to put the finishing touches on it by this Wednesday and Michael won't be able to make it to the rapper's studio until next week. Don't worry though. Michael will appear on a future remix of the song 'Girls, Girls, Girls.' And a sample of the J5's 'I Want You Back' was used for the song 'Izzo (H.O.V.A.)'. 1966 - The Jackson family spent some of their summers visiting Joe Jackson’s father, Samuel Jackson, in Winslow, Arizona. During their time there, they occasionally performed local shows. One such show took place at Winslow’s Elks Lodge on August 20, 1966. Also, sometime during this year (probably earlier), Michael had joined the group to win a talent show contest at Gary's Roosevelt High School, where his older brothers were students. 1983 - The Jackson 5 compilation album "18 Greatest Hits" hit #1 in the U.K.
Edited Telstar 16 Motown singles, plus Happy and We've Got A Good Thing Going on this compilation. Reissue July 1988 by Motown. A heavy advertising campaign, coupled with the phenomenal success of "Thriller" (which dominated the world rankings in 1983) begat a surprising success in the charts. 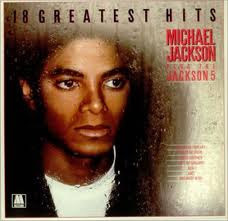 "18 Greatest Hits" spent more than a year in the UK charts and became the 10th sale of the year 1983 (the first being Thriller). Happy for the first time appeared on the album "Music and Me" (1973) and was released as a single for the first time in 1983 to promote this compilation. The English original 45s included a free poster (as will be the tradition in the promotion of Michael's solo albums for Epic). Well, the first Michael tube was brought out to this promotion. 1992 - Michael perform first of three concert at Wembley Stadium, London attending 72,000 fans. 1993 - On 21st/22nd August, the Los Angeles Police Department (LAPD) served search warrants on Neverland Valley and Michael’s condominium in Century City. Several boxes of items were removed but, contrary to press reports, nothing that could be termed 'evidence' was discovered. 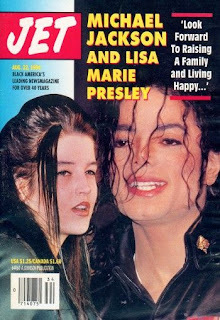 1996 - On January 18th, 1996, it was announced that Lisa Marie Presley had filed for divorce from Michael Jackson. The divorce would become final on August 20th, 1996. 1972 - Michael's single Ben entered Hot R&B Chart. 1974 – Michael Jackson was guest host at Tonight Show with Bill Cosby. He performed the "Dancing Machine". 1984 - The Jacksons perform Victory Tour at the Pontiac Silverdome in Detroit, Michigan attending 47,900. 1997 - Michael performs HIStory world tour at Valle Hovin stadium, Oslo, Norway. Blood on the Dance Floor was taken off the set list for HIStory Tour after this concert. 1990 - Michael welcomes 130 children from the "YMCA" Summer Program in Los Angeles and Santa Barbara to his ranch. They were treated to a barbecue meal, played video games, visited his zoo, and watch movies. Each child was given a free pair of sneakers, and you can bet they weren't Reeboks! The children made him a banner reading, "We Love You Michael" and made him an honorary member of the 8th St. YMCA in Los Angeles. 1992 - Jackson performed for the last time in Glasgow, Scotland on August 18 before being banned by city council chiefs due to complaints of the noise the concert created. 1978 - The Jacksons: Marlon, Michael, Tito, Randy and Jackie pose during a publicity photo shoot after the band signed to Epic Records, at Jackie Jackson's home in Westlake Village, California (Photo Credit: Gregg Cobarr). The band of brothers "Jackson 5ive" with the 10 year-old child star Michael as the lead singer, become the first black teen idols to appeal equally to white audiences. 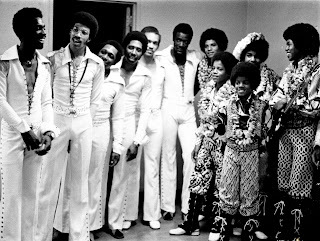 After their departure from Motown to CBS in 1976, the group were forced to change their name from "Jackson 5ive" to "The Jacksons", and Jermaine was replaced with younger brother Randy as Jermaine chose to stay at Motown. After 2 years under the Philadelphia International Records label, in 1978, they signed with Epic Records and asserted control of their songwriting, production, and image, and their success continued into the 1980s with hits such as "Shake Your Body (Down to the Ground)", "Lovely One", and "State of Shock". 1984 – The Jacksons perform their Victory Tour at Pontiac Silverdome, Detroit, Michigan attending 47,900. 1995 - Michael went 'on-line' via the Sony Music Internet, at the Museum of Television and Radio in Manhatten, for his first ever internet Simulcast conducted on three leading online services--America Online, CompuServe, Prodigy--as well as the Internet. It was the largest ever 'cyber chat' at the time, drew in over staggering 25,000 fans around the world – more than 3 times the previous record for a 'cyberchat'! Michael devoted 70 minutes to answer around 100 of the questions about his music & life, while MTV airs MJ videos and special programming while simulcasting the chat session on television, in a unique use of split-screen technology (New York City, NY). He doesn’t pay attention to tabloid junk. He is very resilient, and feels like he has a suit of armour around him – like rhinoceros skin. If he could be any fictional super hero he liked, he would choose Morph, from The X-Men. Why? Because Morph constantly transforms himself, and can even teleport. Among his musical influences are Tchaikovsky, and the great writing of Richard Rodgers and Oscar Hammerstein. The two favourite places he had travelled to are South America and Africa, as he loves the people and the cultures. The favourite song he’s recorded is probably Ben, Got To Be There, Heal The World – one of the oldies. His dream is to make films; not only to act and sing, but to produce as well. 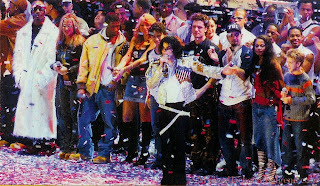 One of his proudest musical achievements is We Are The World, a song he is proud of because it reached so many people. What he missed most during his childhood was the simple little things that kids do – having a friend over, going to the park, trick-or-treat, Christmas and birthdays. If he could meet someone, dead or alive, to talk with them for an hour, he would choose Michaelangelo whom he thinks was a phenomenal artist. Among his favourite songs on HISTORY are Earth Song, Childhood, Stranger In Moscow and Little Susie – he loves songs with heart. He thinks the technology that allowed him to have a simulchat with his fans is incredible, just amazing! As for why he is doing it – for his fans, because he loves them and wanted to talk to them. He also announces the existence of the project titled "Michael Jackson: One Night Only": "I’m doing an HBO special, and it’s intimate. It’s close-up. It will allow me to do things I’ve never done before." 2001 - Michael's long-awaited first single off "Invincible", titled "You Rock My World" premièred on the US radio station "Jammin 105.1". Prior to the singles official release, an unidentified source leaked to two New York radio stations on Friday, August 17, without authorization from Sony Music or Michael Jackson. Immediately after the songs radio airplay the radio stations had received "a herd of [radio] callers asking for more." You Rock My World was first played on the WJTM-FM station at 6 p.m., with WKTU-FM airing the song 45 minutes later. Both stations had played the single every two hours until around 6 p.m. Saturday, when Jackson's record label, Epic Records, called the program director for both stations, Frankie Blue, and asked him to stop. "[They] informed me of the dangers of playing a song too early, [They] said, 'Please do me a favor and take it off the air.'" Blue, a friend of Jackson's, stated on Wednesday, August 22, he would not say how he got the single. 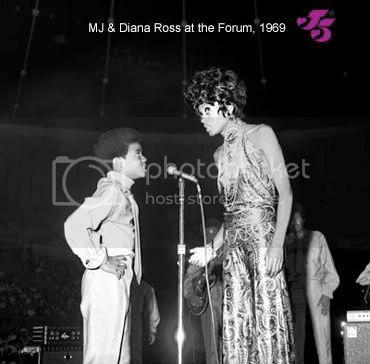 1969 - Motown star Diana Ross officially introduced the Jackson 5 to the press in August 1969, also presented them at the Forum, when the J5 opened for the Supremes – the photo above is from that show. She hosted the variety show Hollywood Palace when the J5 made their national TV debut in October. Her name headlined their debut album, on the eve of her heralded solo breakaway. J5 fans know that she didn’t “discover” the Jackson 5; Gladys Knight was the one who from the road called Motown first. But it was Bobby Taylor, a Motown songwriter and producer, and lead singer of the Vancouvers, who drove the brothers, the band and Papa Joe Jackson to Hitsville in the summer of 1968. More on him in another post. Miss Ross, however, surely helped launch the Jackson 5’s career in a big way. 1973 - Michael Jackson and the Jackson 5 perform in a benefit gig at St. Paul Civic Center Arena in Minnesota, with proceeds of the concert being funneled to the Afro-American Music Opportunities Association (AAMOA). AAMOA, based in the Twin Cities, promotes Black Music and assists Black composers and musicians worldwide. 1992 - Backstage in Leeds, England, Michael meets with 6-year-old Nicholas Killen, left visually impaired after a cancer procedure. 1995 - Michael's album HISTORY: PAST, PRESENT & FUTURE BOOK I was certified 5xPlatinum by RIAA. 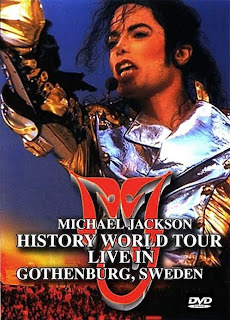 1997 - Michael performs HIStory World tour at Ullevi Stadium, Gothenburg, Sweden attended 50,000 fans. Concert broadcast by TV1000 and Channel 3. This concert is very similar to the Copenhagen concert; also the last professionally filmed performance of Blood on the Dance Floor (though the concert in Oslo on August 19 was the last performance of this song). During "Scream," the pre-recorded a capella vocal of Jackson was malfunctioning. Jackson continued to lip-sync and dance until the vocals continued during the chorus. 1998 - In the States, Captain EO was finally replaced in March 1997, by a new feature, Honey, I Shrunk The Kids. It had its final showing at Disneyland, Paris on 16th August 1998. 1987 - Michael's duet with Siedah Garret "I Just Can't Stop Loving You" reached #1 in the UK Singles chart replacing Los Lobos's hit La Bamba, and stay there for 2 weeks. Michael was in Hong Kong for a short visit. 1993 - Michael Jackson began the second leg of Dangerous World tour in Hong Kong. 1995 - "You Are Not Alone", the second single from from "HIStory" album was released in America, and went on to create chart history. The single debuted at number 1 on the US charts, smashing the previous record set by “Scream”. “You Are Not Alone” was the first song to ever debut at number one on the US Billboard Chart. Michael broke his own record which he set with "Scream" 2 1/2 months ago ["Scream" entered the Billboard charts at number 5, being the then-highest entry of all time]. The number one position is the highest possible debuting position on the single-charts. This record can only be tied but never be broken. Michael was honored with the "Billboard Hot 100 Achievement Award" for having the first ever single in the history of the Billboard charts, "You Are Not Alone", to debut at number one on the charts! The single was a worldwide smash, reaching number 1 in six countries and record sales for HIStory soared. The short film to accompany the song was directed by Wayne Isham and featured Lisa Marie Presley. 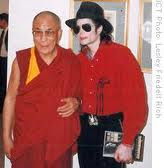 1999 - On Sunday, the Dalai Lama, earthly embodiment of the Buddha of Compassion granted an audience to Michael Jackson. The Dalai Lama left New York Yesterday, but Michael remained in New York finishing an album. While there, he dined at a New York apartment with Dolly Parton and Elizabeth Taylor. According to a source, the focus of much of their talk was the death of John Kennedy Jr. and the dangers Celebrities face when flying private planes. 2004 - Michael Jackson was a special guest of Rev. Cecil "Chip" Murray at the First African Methodist Episcopal Church in Los Angeles, one of the most respected churches in the Los Angeles African-American community. 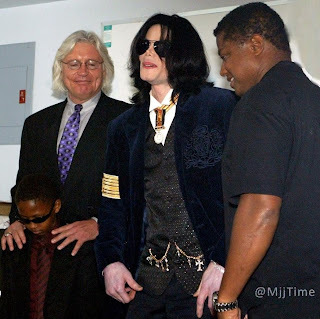 At 10:00 a.m. Michael Jackson, his youngest brother Randy Jackson, entertainer Steve Harvey, and attorney Mr. Thomas Messerau sat comfortably towards the back of the church and enjoyed the service. Although news of Michael's appearance was not widely publicized, the press from most major news channels were on hand. Much of the public learned of Michael's appearance from hearing it mentioned on the Steve Harvey radio program earlier. There were a handful of fans who knew where First AME Church was located and were able to be there to greet Michael. After Michael left the church he made his way to the Cecil F. Murray Education Center, a small school a block away that is run by First AME Church. There, he was scheduled to greet a class room full of about 25 African-American children. The press were told before Michael entered the room that there would be absolutely no questions that would be allowed by the press.